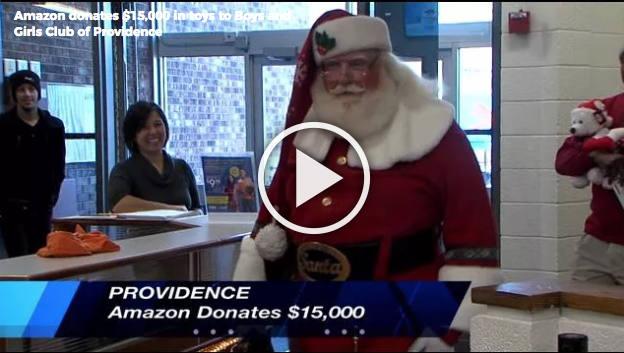 PROVIDENCE, R.I. (WLNE) — The Boys and Girls Club of Providence picked up a big donation Monday afternoon. Amazon and Santa donated $15,000 in toys and supplies. The non-profit was asked to come up with a wish-list of items to help enhance their learning programs. It is part of Amazon’s nationwide giving effort to help organizations in need near the company’s fulfillment centers. “The holidays are Amazon’s favorite time of year. Caravan of cheer it’s the 53 foot trailer,” said Robert Long of Amazon. Mayor Jorge Elorza was also on hand for Monday’s event and was very grateful to Amazon for helping to make many local children’s Christmas wishes come true.